My garden is slowly coming into bloom this year. While the plants have been coming out of dormancy, I have been working around the edges to finally wrap up some projects and put "finishing" touches on the garden. Well, "finishing" for now. I already have a growing mental list of additional adjustments that I want to make. 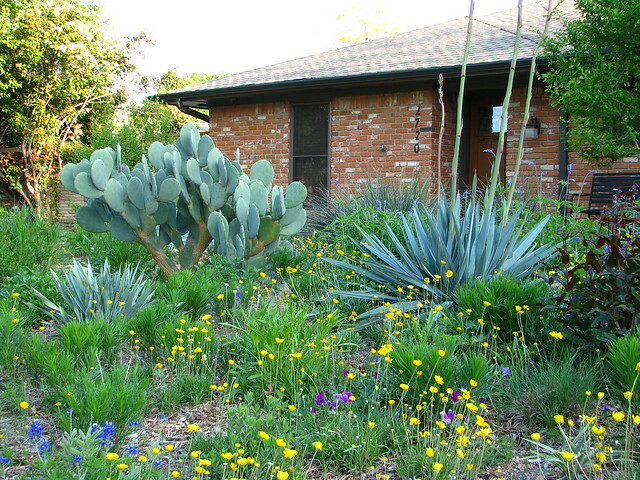 Here in the center of the front garden, Four Nerve Daisies, Tetraneuris scaposa, Winecup, Callirhoe involucrata, Bluebonnets, Lupinus texensis, and Mealycup Sage, Salvia farinacea, are blooming around Pale-Leaf Yucca, Yucca pallida, and a Spineless Prickly Pear, Opuntia ellisiana(?). 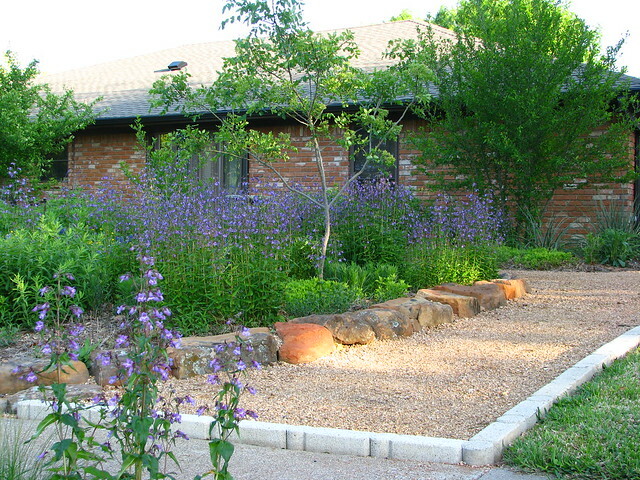 The Coreopsis and Husker Red Penstemon will be blooming in the next couple of weeks. The flower stalks on the Yucca are over six feet tall. This is the second time for this one to bloom. The first time it bloomed was two years ago and the flower stalk was only about three feet high. So what have I been working on for the last few months? Pathways. 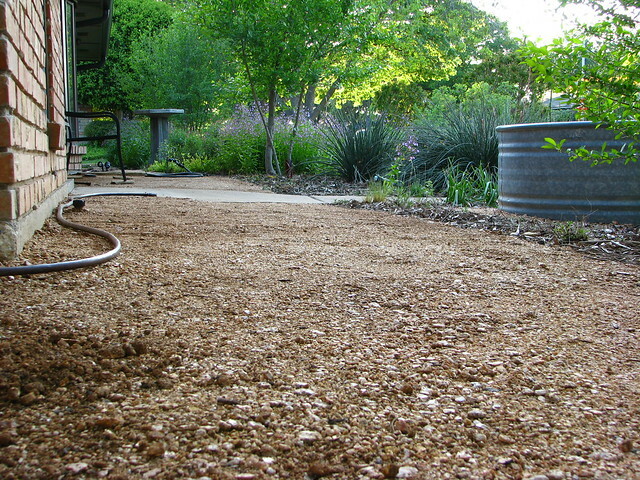 Decomposed granite pathways. I moved the garden edging to the property line and removed the grass from the sides of my front yard garden a year and a half ago. I wanted to add pathways and a buffer zone from my neighbor's chemical lawn treatments and possible overspraying into my garden. Before installing the decomposed granite, I also had to modify the underground drainage pipes and relocate sprinkler heads because pathways do not need to be watered. This is the west side of the garden. The purple flowers are Gulf Coast (aka Brazos) Penstemon, Penstemon tenuis. The small tree in the center of the picture is Hercules Club, Zanthoxylum clava-herculis. 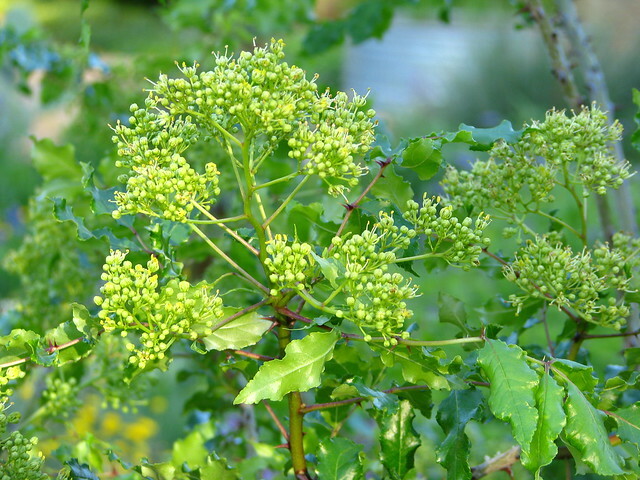 The thorny tree is just beginning to bloom. The flowers are very fragrant and remind me of the scent of honeysuckle. They are very attractive to bees and butterflies. There were not any around at this time, but I bet the trees will be covered in them by the weekend. Up the side pathway is the pathway that cuts across the garden. I installed this pathway four years ago. Unfortunately, my landscape material dealer found a new source for decomposed granite and the new stuff did not match the old. In fact, every time I buy decomposed granite, it seems to be a different color. I have four distinct colors in my landscape. To get it all to match, I scraped off a layer of the older granite and used it as a base for the new granite. Then I replaced the scraped off layer with new granite. 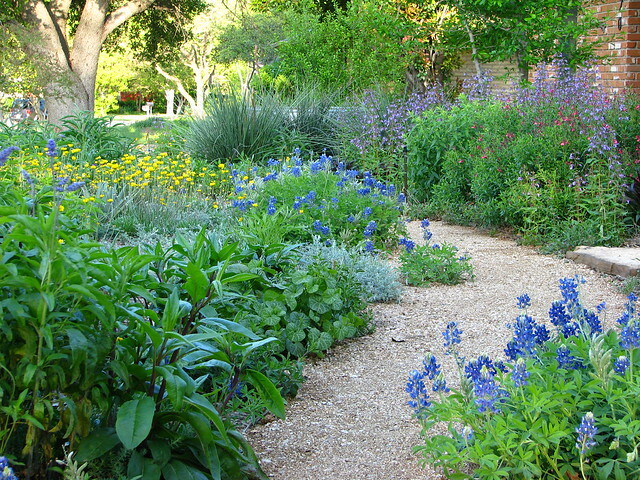 So, now, the pathway that bisects the garden is the same color as the pathways on the sides. Here is the view after crossing the pathway and looking back to the west. What a contrast from my neighbor's lawns. Here on the east side of the garden is another pathway/buffer zone. The challenge on this side of the garden is that parts of my property are over two feet higher than the neighbor's. After having a fence with a treated wood (yuck) retaining wall installed last year, I extended the fence retaining wall about 12 feet toward the street with concrete retaining wall blocks. I got a good price on the retaining wall blocks 5-6 years ago when the Home Depot Landscape Design stores shut down. I wish I had about 15 more blocks. The interlocking white concrete edging was left over from prior flowerbeds when I still had a lawn. 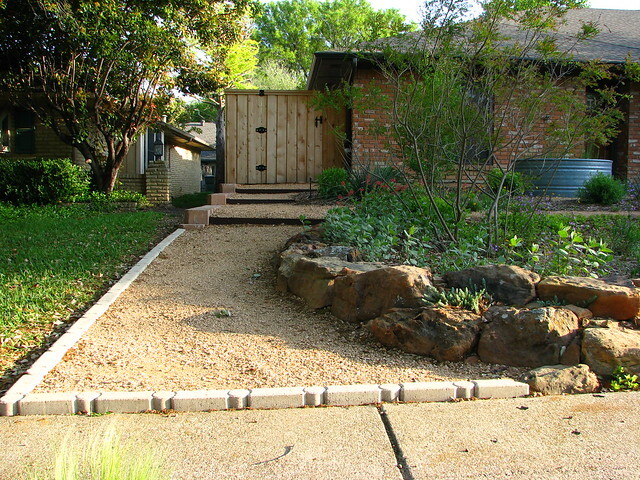 I used steel edging to add three steps up the pathway. 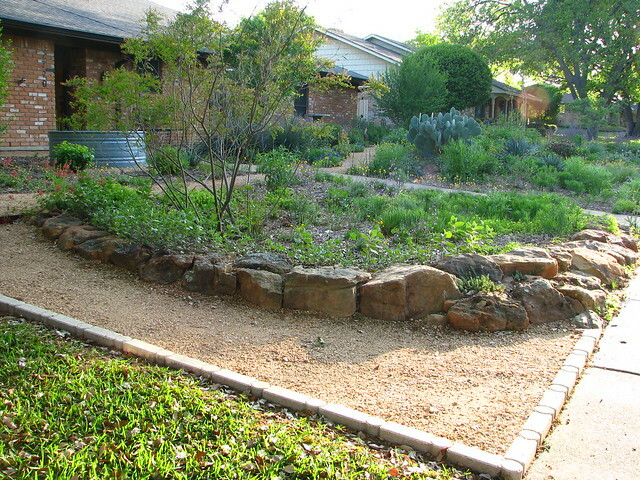 Another project from last year was to install the rocks on the right around the rain garden. 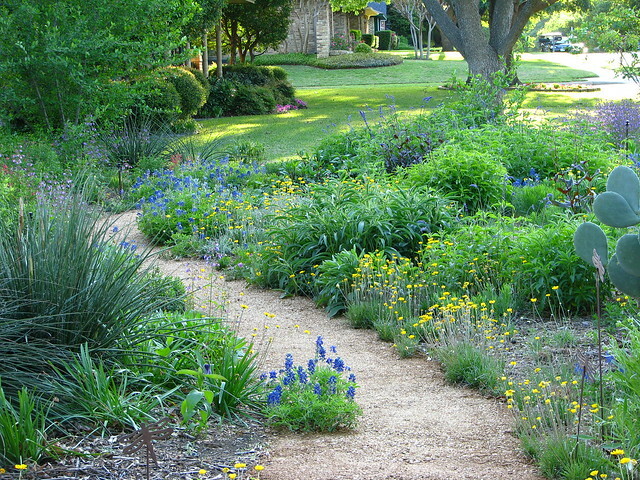 This is a wider view of the rain garden. 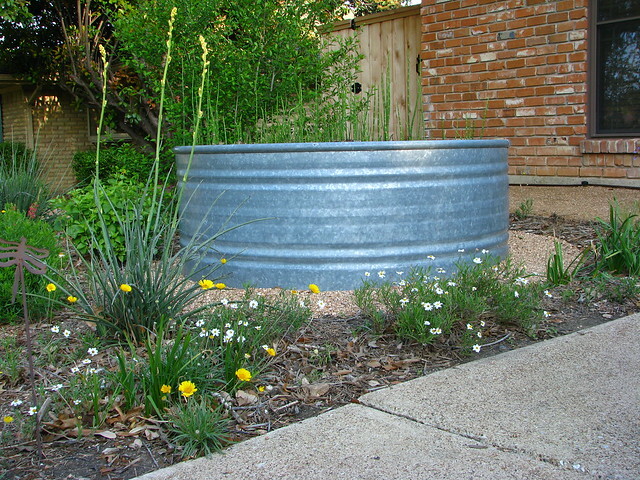 Rainwater from the house gutters is routed through underground pipes to the rain garden. 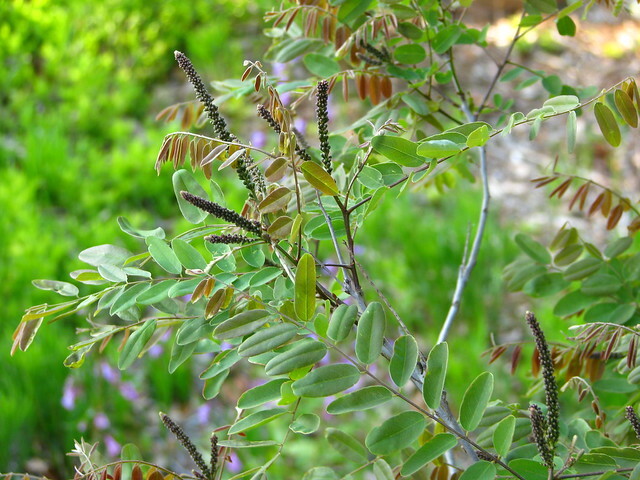 The multi-trunk tree in the rain garden is False Indigo, Amorpha fruticosa. Also in the rain garden are Heartleaf Skullcap, Scutellaria ovata, Gregg's Mistflower, Conoclinium greggii, a couple of varieties of Liatris, and a few other miscellaneous plants that sprouted there. Here is a close up of the False Indigo. The leaves sprouted out over the last two weeks and it will not be long before the purple flower spikes bloom. I mentioned in the last post that I moved the stock tank. 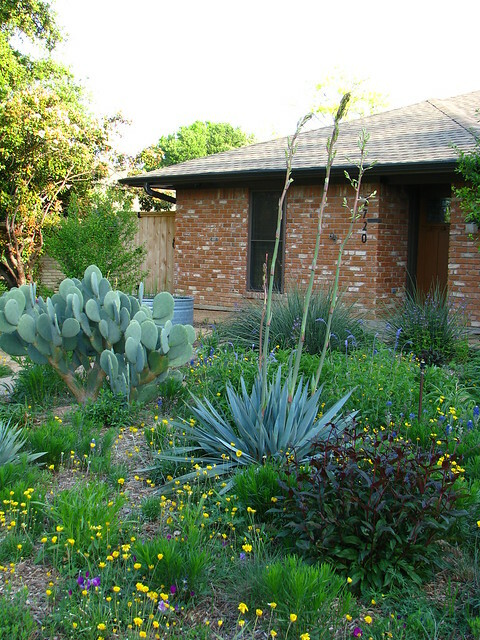 Here it is near the front door, surrounded by Blackfoot Daisy, Melampodium leucanthum, Four Nerve Daisy, and a Red Yucca, Hesperaloe parviflora, with yellow flowers. Horsetail Reed, Equisetum hyemale, grows inside the stock tank. Along the front of the house, I created a decomposed granite porch. I have flagstone for this area, but I am thinking that I may find other uses for the flagstone and just leave the granite. The long snake against the house is a drip irrigation hose with built in emitters. I have this type of hose all around the house in a futile attempt to keep the foundation moist and prevent any additional movement during the dry months. One of the joys of being a homeowner on the blackland prairie. I suspect I use more water on the foundation than the garden. On the other side of the sidewalk leading to the front door is another section of decomposed granite porch. 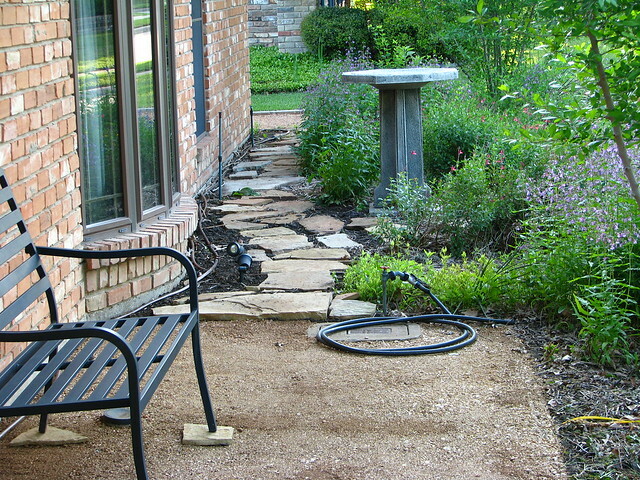 Beyond the porch is a flagstone pathway leading to the side pathway on the west side of the garden. The birdbath is now where the stock tank used to be. It does not look like much, but it looks finished now. It took many hours on my hands and knees digging out dirt so it could be replaced with decomposed granite. The unneeded dirt was hauled to the side yard near the alley and given away to people seeking free dirt on Craig's List. Then there were about 10 pickup loads of decomposed granite that needed to be unloaded, wheel barreled around to the garden, spread, and tamped down. Oh, my aching back. Well, now it is time to move on and apply some "finishing" touches to the backyard garden. Fortunately, there is not as much to do back there. Hello cyber gardening friends. It has been almost three months since my last post. It is hard to believe the time has gone by so fast. You may have noticed that I added a page to the blog with a list of other garden and nature blogs. I still have not added my plant list that I promised in the last post. I have the list in a spreadsheet, but it will require retyping in a different format to get it posted. Otherwise, I have been working on some landscaping projects. I am not ready to share any pictures yet. In fact, I don't have any. I have not taken any garden pictures in the last three months. I guess one good thing about taking a blog break is that I save computer hard drive space. Maybe I will take some pictures soon. I thought I would re-post my April 1 post from last year. It was supposed to be an April Fools' joke about giving up on my prairie garden and going back to a lawn. Or was it? Maybe it was foreshadowing of changes to come? Maybe that is what I have been working on for the last three months? Maybe not. You will just have to wait to find out.